Proven Methods for Building Secure Java-Based Web ApplicationsDevelop, deploy, and maintain secure Java applications using the expert techniques and open source libraries described in this Oracle Press guide. 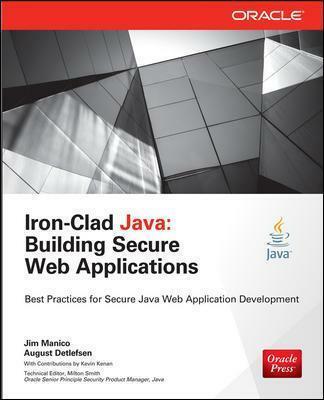 Iron-Clad Java presents the processes required to build robust and secure applications from the start and explains how to eliminate existing security bugs. Best practices for authentication, access control, data protection, attack prevention, error handling, and much more are included. Using the practical advice and real-world examples provided in this authoritative resource, you'll gain valuable secure software engineering skills. Jim Manico is an author and educator of developer security awareness trainings. He is also a frequent speaker on secure software practices and is a member of the JavaOne "rockstar hall of fame". He has an 18 year history building software as a developer and architect. Jim is also one of the members of the Global Board of Directors for the OWASP foundation where he helps drive the strategic vision for the organization. He manages and participates in several OWASP projects, including the OWASP cheat sheet series and several secure coding projects. For more information, see http://www.linkedin.com/in/jmanico or follow him on Twitter at @manicode.